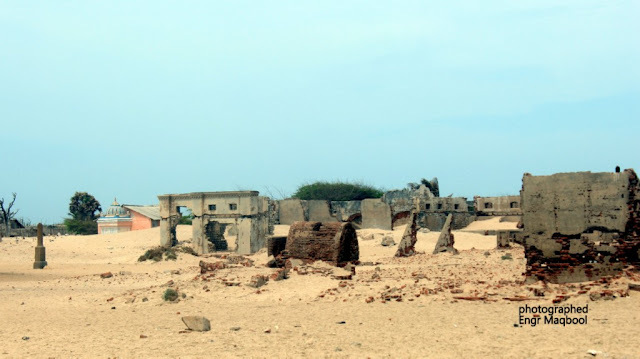 This Travelogue of Dhanushkodi - The haunting real story of a ghost town is in continuation to my previous blog “Pamban Bridge: A Hair Raising Train Ride to Rameswaram”. Finally we were standing at railway plate form of Ramesvaram. Before exit from Railway Station we refreshed us with hot coffee and some snaks. There were plenty of autos available outside station.Hired an auto for advance booked hotel Agnee Teertham (Tamil Nadu Tourism Corporation Hotel) . Hotel Teertham is standing just at one side of Arab Sagar at a short distance from Agnee Teertham Mandir. After dinner in dinning hall of hotel ,other members slept. I took my camera and walked to Agni teertham Mandir. It was dark late night but, many devotees were sill there to perform religious rituals.I clicked some shots and soon back to my room. Dhanushkodi was almost inaccessible till a new road that runs along the ocean was built. It extends all the way from Rameswaram to Arichal Munai or Land's End, the closest point to Sri Lanka on Indian Territory and a point flanked by the ocean on all three sides. After half hr journey of 20 Km,we saw a long stretch of Bay of Bengal, running just parallel to road.As we drove nearer to Dhanusukodi ,this lining of Bay of Bengal was coming closer and closer to road.It was life time ride ,I was seeing Indian Ocean on other side of road.wow…..now the road was in between two seas. Dhanushkodi is a Beautiful place lies as a land of sand in the center of roaring ocean (Indian Ocean) and a silent sea (Bay of Bengal). Dhanushkodi fills the visitors with the feel of awe by its spectacular view of clear Blue Sea, Roaring tides, Beach and the Lonely Devastated Ghost land. As per Hindu mythology, this is the place from where Lord Hanuman along with his army built a stone bridge (Ram Setu) to cross the sea to reach Lanka (now Sri Lanka) to rescue Sita from the demon king, Ravana. Thereafter the war, Lord Rama broke the bridge with the tip of his bow. The word Dhanushkodi can be split into dhanush (bow) and kodi (the end) literally it means “The end of the bow” in Tamil language. Sri Lanka is just 31 kilometers away from Dhanushkodi. 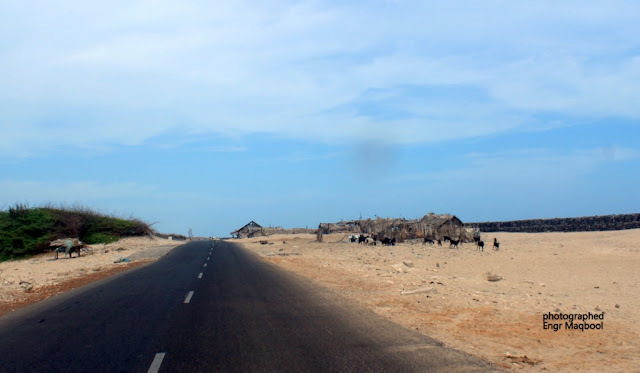 Bordered by the Bay of Bengal on one and the Indian Ocean on the other, Dhanushkodi, some 20 kilometers away from Rameshwaram, is one of the most spectacular stretches of Tamil Nadu. If you have the ears to listen the silence too. You may hear the sounds of cries, the recitements of the prayers in the remnants of the Catholic Church, the noises from the broken pieces of busy railway station and the port office. 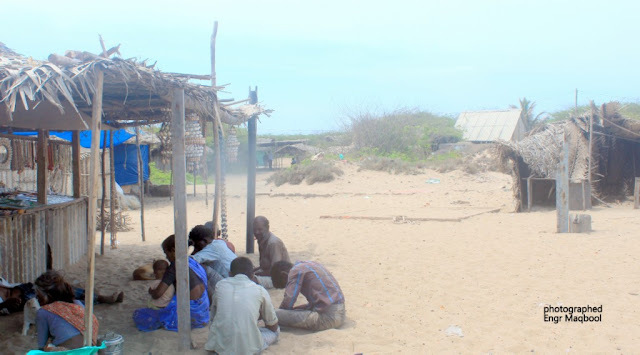 All the places of Dhanushkodi were filled with Darkness…The heavy rain slowed down and, the clouds started drizzled the drops. People believed that the things would get normal the next day, and went for sleep with the hope filled minds. On that night at 23.55 hours a tsunami hitted Dhanushkodi railway station, the train No.653, Pamban-Dhanushkodi Passenger, a daily regular service which left Pamban with 110 passengers and 5 railway staff, was only few hundred yards before Dhanushkodi Railway station when it was hit by a massive tidal wave. The entire train was washed away killing all 115 on board. 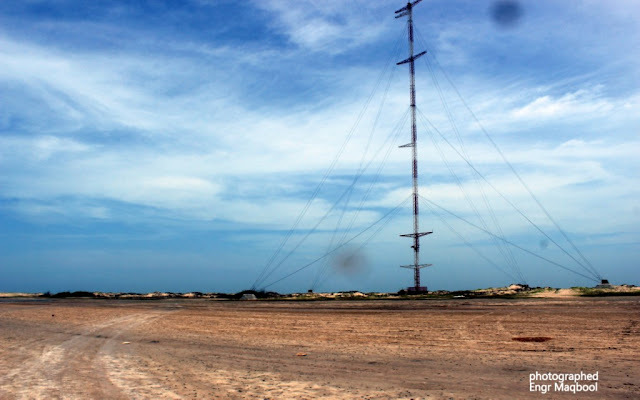 A few meters ahead of Dhanushkodi, the signal failed. With pitch darkness around and no indication of the signal being restored, the driver blew a long whistle and decided to take the risk. Minutes later, a huge tidal wave submerged all the six coaches in deep water. The tragedy that left no survivors also destroyed the Pamban Bridge, which connected the mainland of India to Rameshwaram Island.The waves were energetic. They say the sea is male in Dhanushkodi and female in Rameswaram. The pairyearns to embrace each other and devastates the seven-km sand strip separating them. 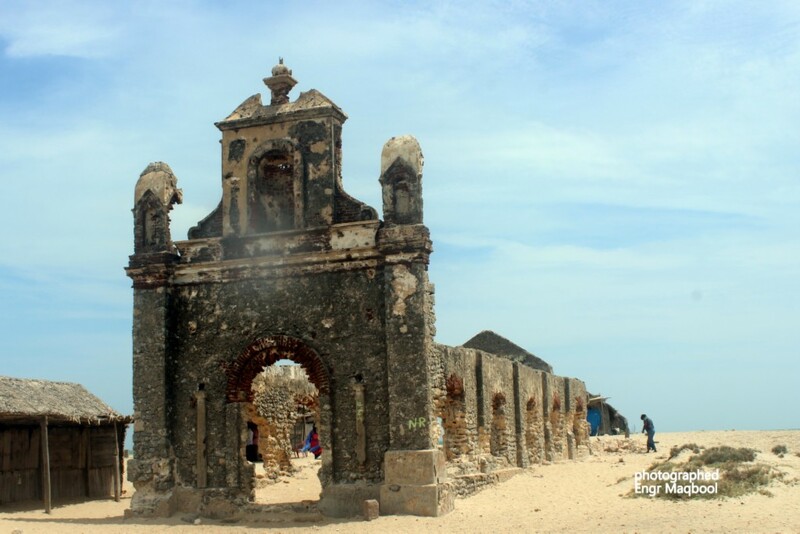 Dhanushkodi was a busy township with European bungalows, church, temple and even a railway station. 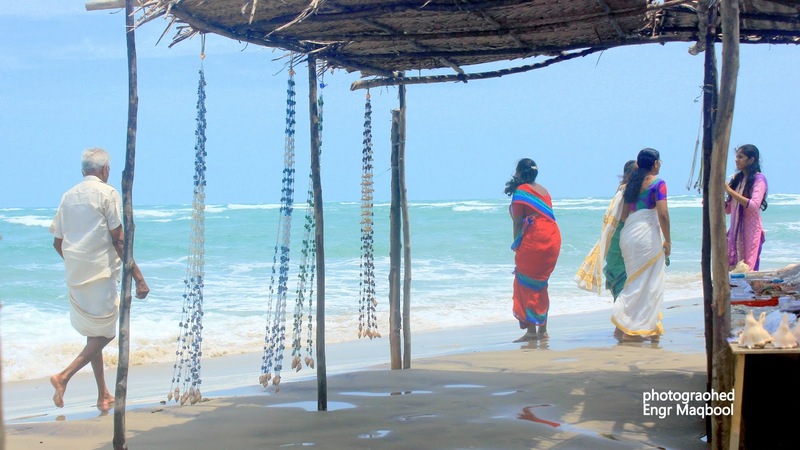 There were many ferry services between Dhanushkodi and Talaimannar of Ceylon (now called Sri Lanka), transporting travelers and goods across the sea. There were hotels, textile shops and dharmashalas catering to these pilgrims and travelers. Dhanushkodi, in those days, also had a railway station, a small railway hospital, a higher secondary school, a post office, customs and port offices etc. One can still see the sad remains of the railway line, some of the ruins of the offices and the hospital and the old school, which is reused now for the 500 inhabitants who continue to stay on the island. 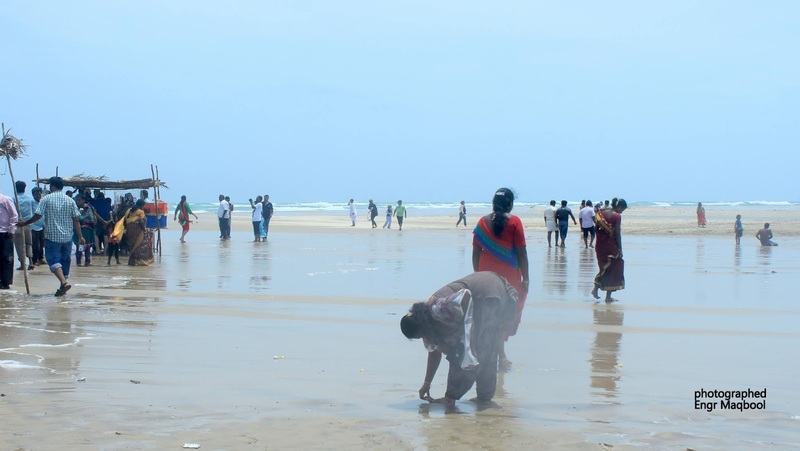 Before the cyclone, there was a train service up to Dhanushkodi called Boat Mail from Madras Egmore (Now Chennai Egmore), which would halt on the south-eastern side of Dhanushkodi township, where a waiting steamer transported passengers to Sri Lanka. 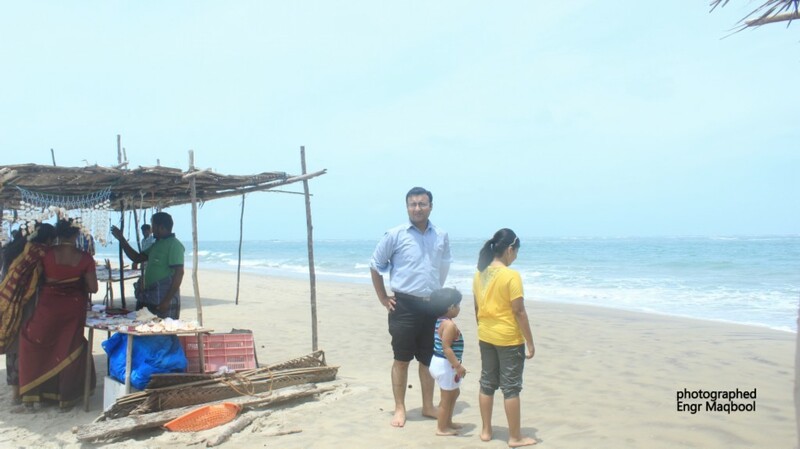 At Main land of Dhanushkodi beach: The last south eastern tip of Indian soil. 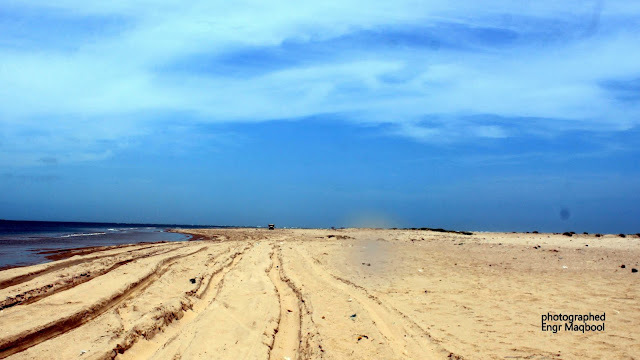 Soon we reached the check-post.Our jeep was running rouh and jerky on a land mix with the mud, sand and water .We reached Dhanushkodi old town after one hour travelling. 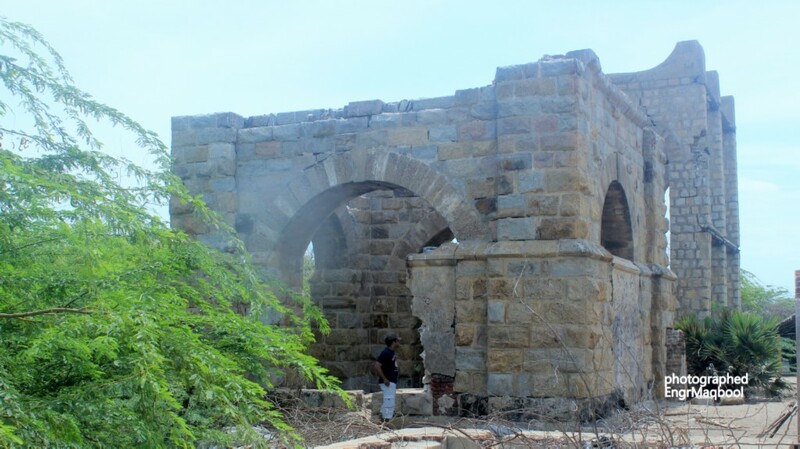 A little ahead, we come across the ruins of a water tank, church, post office, custom office and other buildings, once a popular town.All these were totally washed away by a deadly cyclone in 1964. The town has been rendered unfit for living and is a ghost town, but a few fishermen still live here in tents and huts. The ruined buildings of the church, temple, school and homes around were silent testimony to the great cyclone. Lost in the surrounding, I almost tripped over only to find a glimpse of what appeared to be the lost train track concealed under sand leading to a ruined structure which has seen busy days as the local station. It was unbelievable, the sea was so blue and so was the sky. The sand was so white, the beach was very clean, I never seen anything like this in India. I had to walk for two hours to get to the place where it used to be “Danushkodi Station”. I couldn’t find any sign of the train tracks, except a couple little piece of metal sticking out of the ground. I finally reached the South-Eastern tip after a brisk but a little long walk. It was absolutely wonderful! Seeing two oceans meet is a heart-warming sight and the feeling. Water from two oceans was brushing under our feet … amazing. I had been dying to see this place.This point of this tour just made my entire trip-- A golden memory. Now it was time to say good-bye to the blue seas and white sands. I recalled the lines of this old ever green song of Film Madhumati that seems fit for this place.It is real story of Dhanushkodi, which is now a haunted ghost town due to Tsunami on 22nd December 1964.